Latter-day Saints teach that there was a need for a divine restoration of the Gospel of Jesus Christ, including the keys of priesthood authority and major offices such as apostles and prophets, due to what we call the Apostasy. This refers to a lengthy process in which divinely called leaders were rejected and lost, and in which outside and man-made doctrines and practices were introduced to the church. While mainstream Christianity preserved much of the Gospel and the scriptures, for which we are most grateful, an examination of early Christianity shows that there has indeed been a loss of many key concepts. From the middle of the 4th century onward, however, Christian thought was strongly influenced by Neoplatonic philosophy and mysticism. In the East, Basil of Cesarea, Gregory of Nyssa, Synesius of Cyrene, and Nemesius of Emesa, and, in the West, Marius Victorinus, Ambrose, and Augustine, made abundant use of Plotinus or Porphyry, frequently without citing them. . . . Note that a dominant pagan philosophy that strongly influenced Christianity would, centuries later, seem "naturally Christian" to those steeped in Hellenized thought. Neoplatonism, in the view of one historian, "was the last breath, the last flower, of ancient pagan philosophy; but in the thought of Augustine it became the first page of Christian philosophy" (Copleston 1:506). Apart from influences that are now recognized as Neoplatonist, however, Christian writers found much in the older Platonism that helped them in their understanding of Christian theology and much that helped them answer philosophical questions without compromising their theology [Riedl is overly optimistic here!]. They found evidence for the unity of God, preexistence of the forms of things in the mind of God, creation of the world, . . . [etc.]. The Greek apologists during the reign of Antonines were educated in the pagan schools of philosophy. They used their knowledge to point out to the emperors, themselves philosophers, that Christian doctrine was reconcilable with philosophy, and therefore not to be condemned. . . . This process of making Christianity seem compatible with a dominant pagan philosophy greatly accelerated the process of apostasy, in my opinion. There is much more to say on this topic. One useful resource isMormonism and Early Christianity by Barry Bickmore. Dig into Barry's impressive site for a wealth of knowledge about the Apostasy. I continue to be amazed at the depth of evidence left by witnesses to the Book of Mormon -- men who saw and held the gold plates, including some men who even saw the Angel Moroni and heard the voice of God, none of whom ever denied their witness, in spite of some of them becoming upset with Joseph and the Church in later years. These were men known to be honest and trustworthy in their communities. To their dying day they stuck by their testimony of the Book of Mormon, though it brought them nothing but trouble. How can such witnesses be reconciled with the idea that the Book of Mormon was a fraud? In fact, if it were a fraud, the key to success is to have as few people in on the conspiracy as possible. The idea of taking three and then eight more witnesses to make a public proclamation of something that would surely bring ridicule and persecution - well, it just doesn't make sense if Joseph were a fraud, unless he were wildly foolish, in which case it would surely have backfired on him. Also see James T. Summerhays' article, "The 120 Witness Miracle" in the most recent Meridian Magazine. It calls our attention to the many witnesses of divine manifestations testifying to Joseph Smith's role as a prophet of God. Let us not discount the power of so many witnesses. If you've never lived in Wisconsin, it may be hard to appreciate just how important the Packers are to people around here. For many Wisconsinites, the Packers are part of their religion, and there is no better way to spend a Sunday than watching the Packers in person or on TV. So you folks outside Wisconsin might be surprised to learn that the Appleton Wisconsin Stake gathered today to have a rather unusual Stake Conference. Instead of the normal fare of local speakers, we all watched the Packers projected live on a big screen. I'm not making this up. And honestly, it was a spiritual experience. Both Boyd K. Packer and his wife, Donna Packer gave marvelous talks. It was part of a regional Midwest broadcast to 61 stakes, broadcast live from Salt Lake City with the Packers and a couple other General Authorities and their wives. Nice format! Today marked a big change for me. Now, at last, I can proudly say that I'm a Packers fan, and even had a religious experience watching the Packers on Sunday. Go Packers! "A Well Read Prophet" at Let Your Mind Alone points out that President Hinckley is reading and publicly referring to serious works from non-LDS sources that he has been reading. This is a wonderful example of following the scriptural command to seek learning "out of the best books" - a descriptor that obviously exceeds the small literary realm of LDS writers. Hurrah for President Hinckley! There are so many great books out there demanding our attention, so much benefit to be gained by reading. Let us dig in and feast upon the many words available for our nourishment, while also feasting upon the scriptures. How Do Non-LDS Folks Respond? I was surprised to see the LDS-related movie, The Work and the Glory, playing in my little Wisconsin town of Appleton, Wisconsin. We went on a Friday night where I ran into several other LDS families. It looked like a group of about 7 or 8 non-LDS people were there as well. Sparsely attended. I was generally impressed with the movie. I thought the photography was outstanding and the acting was far beyond my expectations. For example, I found the father, torn by the pain of his family becoming Mormon, to be very believable. Joseph Smith struck me as just a little too self-assured and perhaps a tad too much like the Midwestern stereotype of a buff and cocky Californian twenty-something, but that's the way movies are done, I suppose. (Perhaps I'm revealing some biases here.) I also thought the First Vision account was handled very tastefully. Overall, it was an outstanding film for an LDS audience or for investigators of the Church. But it is being distributed to general audiences. What about all the people who walk into the theatre not knowing that they are about to see a very pro-Mormon movie? I worried that non-LDS audiences might be caught off guard and surprised or even offended. The trailer for the movie, like the printed ads, provides no warning of explicit religious content, and no indication that this might be considered a pro-Mormon movie that suggests that Joseph Smith was a real prophet of God. Perhaps there reaction may be a stronger version of my reaction to the Robin Williams movie, "What Dreams May Come," when the interesting treatment of the afterlife suddenly shifted and the whole movie became senseless when it began advocating the concept of reincarnation. Though I enjoyed it as a whole, the end of the movie seemed to become an ad for New Age Hollywood religion. Well, I should have seen it coming, and certainly couldn't expect Hollywood to do much less. But the shift from a somewhat "mainstream" religious concept - that of an afterlife with a paradise and a hell - to pure New Age themes of reincarnation bothered me. And it was truly senseless in the context of the movie - Robin Williams has just faced hell to rescue his wife so they could be together, and now they are going to risk losing their relationship by each being reborn and starting over? Silly. The Work and the Glory was far from silly. It was well done and often powerful. But I felt there needed to be some kind of indication to non-LDS people that this was a Mormon-related movie. Perhaps something like, "If you liked The Godmakers, you'll hate this movie." Or may, "A movie about good people becoming Mormons that even some non-Mormons will enjoy." Someone wrote me complaining that they couldn't find a listing of Presidents of the Church on Google. It wasn't a trivial search, but I did find a valuable resource on LDS Prophets at LDS.org. (Looks like the LDS.org site could be further strengthened to make it more Googlible - or is the term "Googlific"? "Googlarious"? "Googlecalifragilistic"?) Not only does it provide a listing, it also provides many other resources with biographical information, quotes, images, etc. All at a basic level, but useful. I've been amazed in the past week as I've observed the mainstream media dig their fangs into the new Pope. They have turned to dissidents, to homosexuals, to liberals and self-styled intellectuals to raise serious questions about the suitability of the new Pope, to wring their hands over his "archaic" and "repressive" ideas and to bemoan his inability to welcome sin more fully into the Church. How could he not see things the same way as the media? The reasons for the Pope's backwards attitudes has been a mystery until now. Thanks to America's investigative media, the truth has come out, the terrible truth the illustrates just how dangerous this man is. Brace yourself for this shocker: the Pope is Catholic. Faithful Catholic, no less. He actually believes the teachings of his Church and can be expected to continue teaching none other than Catholic doctrine. Why the Cardinals didn't pick Hillary Clinton or some senior editor of the New York Times, the mainstream media just can't fathom. You would never know by listening to the mainstream media that the Pope is a respected thinker who speaks 10 languages. And we're not talking Pig Latin. The Jewish World Review has a hilarious review of Martha Beck's recent book of fantasy: "Bulimic Broads" by Marianne M. Jennings. I must apologize for Marianne, though - she lacks obsequious sensitivity and does not accept at face value the farcical elements that Martha Beck "believe[s] to be most true." In fact, she's not even a big fan of Oprah. Brant Gardner's essay at FAIRLDS.org, "The Case for Historicity: Discerning the Book of Mormon's Production Culture," is a must-read for those seeking to better understand the Book of Mormon. He makes the point that writing fiction about a foreign culture will inevitably show that the author was not part of that culture, for there are a thousand unconscious assumptions that must be made that will be informed by the author's culture, not the actual culture being described. On the other hand, a text from a foreign culture will provide numerous puzzles to outsiders that will be confusing until insight is gained about the assumptions and ways of the other culture. With this in mind, the Book of Mormon is simply loaded with issues that are puzzling to modern Americans but thoroughly at home in the ancient world, including ancient Mesoamerica. Brother Gardner's article includes a detailed discussion of one especially interesting example, the story of the great missionary Ammon and his adventure at the waters of Sebus (Alma 17 and 18). Modern readers are puzzled over many of the details, and some may even mock the silliness of the strange events described. The story is puzzling if one relies on modern culture to interpret the story, but Brother Gardner shows how the story becomes profoundly more meaningful if interpreted in light of ancient Mesoamerican politics. This is one of many examples where a knowledge of the ancient world suddenly adds new depth to what was once puzzling in the Book of Mormon. How can such a track record be reconciled with the idea of the text being a modern fraud? The fascinating part about Ammon is about halfway down Gardner's text, under the section heading "The Test of Productivity." The Oneida Indian Tribe of Wisconsin held a Pow Wow on April 9 in Green Bay that I was able to attend for a while. I was quite impressed and plan on going to more of these. While there, I talked with the man pictured below. In the Oneida language, his new name means "Bear Who Dances for the People." He received it as a young man from an Elder of the tribe. The Elder saw him unfold some cloth with a certain symbol on it, and told him that this was what the Elder had seen in his dreams, and that he knew the name the young man was to receive. Receiving this name helped clarify the young man's mission in life. He told me of the spiritual power he finds in dancing for the people, as he is doing in this photo. His experience with the Elder of the tribe, including the receipt of a new name and a sense of mission in life, reminds me of the LDS patriarchal blessing. We agreed that this was a great blessing for him. I was touched by his gentleness and humility, and by his talk of the significance of sacred dancing and the communion that he finds with the earth. 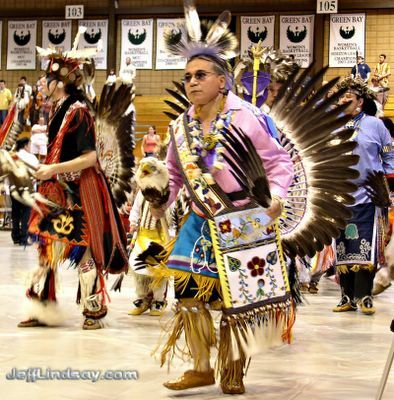 Bear Who Dances for the People - an impressive Oneida man I met at the Spring 2005 Pow Wow in Green Bay, Wisconsin. I appreciate the spirituality that he has found and the strength of character that he has. I also was deeply touched by the power of the dance that opened the Pow Wow. It was beautiful and even inspiring. 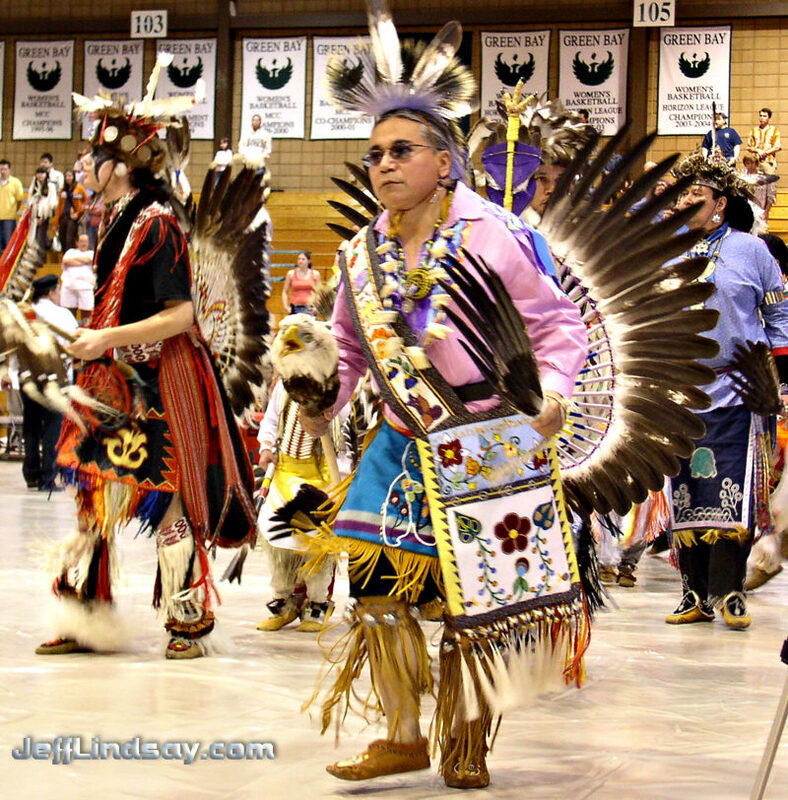 A couple more photos are on my page about the Oneida Indian Tribe of Wisconsin. Members of the Oneida Tribe, by the way, were among the first people in my part of Wisconsin to join the Church and have played a key role in the growth of the Church here. Latter-day Saints are still a small minority among the great Oneida people, but they are a strong a faithful minority that has done much to bless the lives of others. "Cognitive dissonance" is a common buzzword these days for disgruntled Mormons, ex-Mormons, and anti-Mormons. It's a fancy way of saying that there are lingering doubts, puzzles, and intellectual irritants for those who are LDS. Of course, this is true for those of any faith, including atheism, and it's true for any field of knowledge: all the apparent facts, all the stories and allegations, all the experiences and observations cannot be assembled into one smooth, coherent whole. There are always pieces that don't fit or seem to challenge the assumptions that hold other pieces together. The fact that the details of our religion, our scriptures, Church history (in its many forms and with its diverse sources), world history, science, and knowledge in general results in many puzzles and conflicts is somehow supposed to be an intolerable burden that should make intellectually honest Mormons crack and leave the Church. For those who say they left the Church after suffering with "cognitive dissonance" for years and finally found intellectual satisfaction by rejecting the LDS faith, in many cases they say that their objections are based on taking offense at the actions or statements of modern prophets. They are often offended by polygamy, for example. The idea that Joseph Smith or Brigham Young should have multiple wives is something that puzzles me and even bothers me. It's not how I would do things. But as offensive as that practice may be, what basis do we have to reject the Church because of it? I have the same level of cognitive dissonance over the behavior of Abraham, for example. Good grief, even the biased pro-Abraham record of the Jews reports that Abraham was a polygamist who cast out his concubine Hagar and her son, sending them into the wilderness with just a bottle of water where they may well have died had it not been for a miracle. That offends me. And one could easily be sorely offended over Abraham's attempt to sacrifice his son - can you imagine how the antis would sneer if that experience had been Joseph's and not Abraham's? And then there was the lying to kings about his wife and other incidents. Based on the information we have, I can honestly say that God and Abraham did not do everything the way I would do if I were in change, and the discrepancies bother me. But Christ Himself referred to Abraham as His friend, and often referred to the God of Abraham. Abraham was a prophet of God. I can choose to be offended over his marital practices and child rearing traits and the honesty of some public statements based on my understanding of the story, but my offended sensibilities give me no just grounds for abandoning God and rejecting his messengers. One ex-Mormon recently wrote that all my info on Book of Mormon evidences really strengthened him for a while, but then he finally cracked under the burden of "cognitive dissonance" from the problem of polygamy. He said all the cool stuff about Book of Mormon evidences doesn't mean a thing now because he is convinced that Joseph Smith was acting poorly regarding polygamy. Now the dissonance is gone. To me, this is a sign of a less active brain rather than a more vigorous one. If the Book of Mormon is not an obvious fraud, then there is a real possibility that Joseph Smith was a prophet - at least for a moment or two - and a possibility that our offense at his doctrines, statements, or practices might not be a reflection of some absolute standard of truth, but our own subjective viewpoint. Regardless of one's beliefs, if one finds that dissonance is gone, some part of the brain has shut down. Sure, there are Mormons who accept things way too readily and don't think carefully about their religion, the scriptures, and so forth. We need to ask questions and not run from truth. If science says something that contradicts our beliefs, we don't need to run from science - we can explore and question and understand where the conflicts may be. Don't be surprised that there will be puzzles that we can't resolve - everything from the age of the earth, the nature of Creation, former priesthood exclusions, polygamy, etc. We do not have all the answers - we only "see through a glass darkly" and have access to only a tiny piece of what God will yet reveal. The anti-Mormons are appalled that we don't crumple at the impact of the first tough anti-Mormon attack that comes our way, and blame it all on sheepish stupidity. But those who honestly seek the truth and have obtained solid testimonies of the Restored Gospel of Jesus Christ know that there are problems and contradictions that must be dealt with in faith and patience for now, just as early Christians did who faced the cognitive dissonance of many "eye-witnesses" who testified that Jesus was a sinner, a corrupt and immoral man, and who testified that the Resurrection was all a fraud. The learned, the educated, the religious leaders of the day, the politicians and popular masses all spoke against Christ - cognitive dissonance thundered and echoed across the valleys - yet there were men and women who KNEW through the power of revelation that Jesus was the Christ, and some blessed witnesses who saw and touched and bore witness that they had seen the glorified Savior, just as we have been blessed to have such witnesses in our era, including those who saw and touched the plates of gold. I don't fully know why we had to have polygamy or even if it was truly necessary. I don't know why Brigham Young did not share all my enlightened views and why he gave some opinions that bother me. I don't know why Gordon B. Hinckley doesn't share my views on many issues. And I still can't figure out why the Lord has not elected to do things my way in general - what a great world this would be then! But all that dissonance is not enough to make me deny what I do know: that the Book of Mormon is a sacred and authentic ancient record translated in our day by a very real but human Prophet of God. The Church is imperfect, as all its members and mortal leaders are, but I know Who the source of this Church is: Jesus Christ. That knowledge gives me the strength to put up with a lot of cognitive dissonance on things where I don't know enough to answer my questions or yours. It's not that I'm brain dead - I believe my brain is active and seeking further light and knowledge daily, but the dissonance would get even worse if I were to abandon God or the Gospel over my offended sensibilities. I have seen too much, experienced too much, learned too much, received too much and (gasp) felt too much to maintain any intellectual honesty in denying the Book of Mormon, the reality of the Priesthood, the existence of God and Jesus Christ, the power of the Atonement, the power of prayer, and the sacredness of the Temple. We don't have all the answers, and it may be that some things we Mormons take for granted are wrong and will need correction some day - but there are at least some things that are right and wonderful and truly from God. While this is old news, Kaimi Wenger at Times and Seasons has called for a Google link war for the term "Mormon Temple" so that those searching for "Mormon Temple" will find the Church's site in the top 10 rather than just anti-Mormon junk. He's asking people to provide links to www.ldstemple.com using the term Mormon Temple, as I've just done and have done on my list of links to the right. Great idea, Kaimi! I would also suggest that people providing links include the "title" parameter in the HTML code to add additional text, as I have done for the link above. In the HTML code after "a href = ....", add something like title="mormon temple, mormon temples, lds temple, Christian". For what it's worth, if people search for the term "Mormon temples" or "temples Mormon", one of my pages is in the top 10 on Google and is currently the first pro-LDS site listed. The page is http://www.jefflindsay.com/LDSFAQ/FQ_masons.shtml - my Mormon Answers page about the Mormon Temple and Free Masonry, which includes a lot of information about the ancient nature of the restored LDS Temple. I'd appreciate any additional links to that page as well using terms like "Mormon temple" and "Mormon temples". A few more photos from our recent trip to Mexico are available in an online photoalbum at Sanity Defense. A photo of the Mexico City Temple is included. More will be added soon. One of my favorite recent LDS publications is now available online: True to the Faith: A Gospel Reference. I've given this booklet out to many people in our ward and have found it a handy general reference and useful tool for lessons. As Roasted Tomatoes points out in a recent post, it's great to have a relatively reliable publication giving Mormon doctrine without quite so much "Mormon opinion." Children are entitled to be raised by parents who honor marital vows and who provide love and support. Adoption can be a great blessing for many children who are born without this opportunity. When a child is conceived out of wedlock, the best option is for the mother and father of the child to marry and work toward establishing an eternal family relationship. If a successful marriage is unlikely, they should place the child for adoption, preferably through LDS Family Services. Placing the infant for adoption through LDS Family Services helps unwed parents do what is best for the child. It ensures that the child will be sealed to a mother and a father in the temple, and it enhances the prospect for the blessings of the gospel in the lives of all concerned. Adoption is an unselfish, loving decision that blesses the birth parents, the child, and the adoptive family. During our recent trip to Mexico, we spent a few days in the city of Oaxaca and then went to Huatulco on the west coast of Oaxaca State. Huatulco in the Nahuatl language supposedly means "place where timber is adored" and is said to refer to the worship of a wooden cross by the native inhabitants of Huatulco (Zapotecs) before the Spaniards arrived. The English pirate Thomas Cavendish attacked the port in 1583 and tried to destroy the native cross that stood on the beach, but the cross was miraculously preserved. Spanish authorities later distributed portions of the sacred wooden cross to many other regions. One such place is the city of Oaxaca. 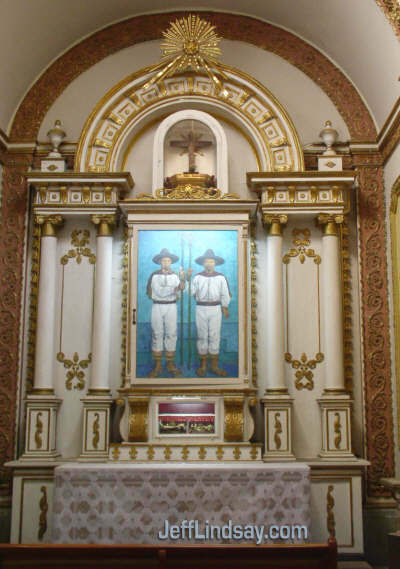 A wooden cross taken from the holy cross of Huatulco is present in a side room at the Cathedral of Oaxaca, shown below in a photograph from our recent trip. Side room in the Cathedral of Oaxaca with a wooden cross made from a portion of the original ancient wooden cross worshipped by Native Americans at Huatulco, Mexico. One version of the legend, perhaps influenced by eager priests (the whole legend may be suspect, of course), attributes the worship of the cross to a visit from the Apostle Thomas. If there is anything to this legend, perhaps it could be compared to the significant role of the cross at Palenque as well. Did ancient inhabitants of Mexico know of the cross as a figure of religious significance? As with legends of Quetzlcoatl, it may be hard to determine what parts of the legend truly reflect precolumbian beliefs and practices, but the legend of the wooden cross of Huatulco may be a story worth knowing about. Perhaps there is more than a sliver of truth to it. 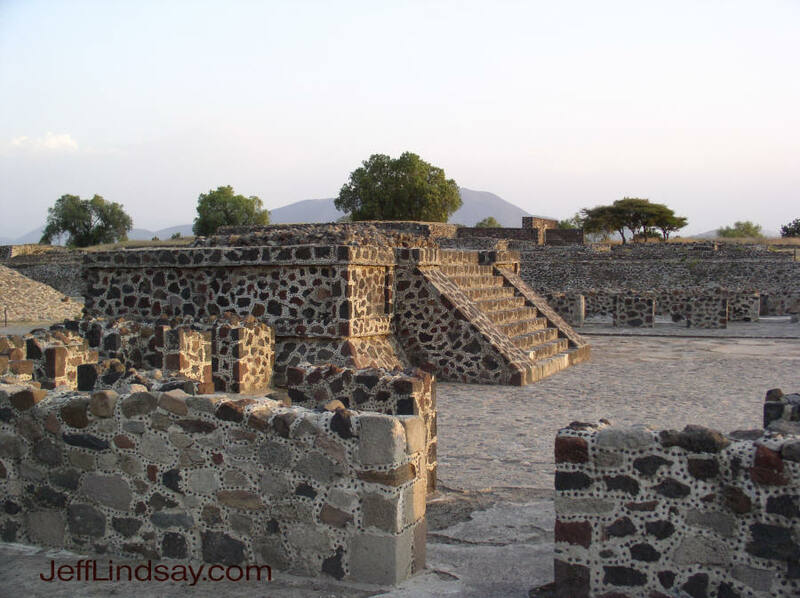 AncientCumorah.com has a good photo of the Hill Vigia in Veracruz State, Mexico, believed by many LDS scholars to be a plausible candidate for the ancient Hill Cumorah, site of the final great battles of two civilizations, the Nephites and the Jaredites (the latter called it Ramah). That hill meets the criteria required by the Book of Mormon: a place that would offer a significant advantage to a large army (unlike the puny mound called Hill Cumorah in New York State, which hardly stands out from the many other tiny hills around it), a place with fountains of water (essential for a large body of people), near the east sea, north of the narrow neck of land, prominent enough to be well known to many people, etc. I know we've all assumed that the hill where Joseph found the plates is the hill where the Nephites fought their great battle and kept a repository of sacred records - but the Book of Mormon does not say that Moroni stored the Book of Mormon plates in the Hill Cumorah. It says that many Nephite's sacred records OTHER THAN the Book of Mormon were kept there. The text ends with the plates in Moroni's possession as he wanders. I assume he wandered away from Mesoamerica, going far north to present-day New York State and buried the plates there, or he could have done it after his resurrection, or the Lord could have moved them there. But the idea that the Hill Cumorah/Ramah described in the Book of Mormon is in New York simply doesn't fit the text, though many early Mormons made that assumption. Joseph never said that the hill where he found the plates was the Hill Cumorah of the Nephites - though it's an easy thing for people to assume, at least initially. The really interesting thing is how well the Hill Vigia in Mexico corresponds with the requirements of the Book of Mormon. See David Palmer's book, In Search of Cumorah. There were several things I encountered during my recent trip to Mexico with possible relevance to the Book of Mormon. For example, ancient figurines at Monte Alban (near Oaxaca) show facial types unlike the typical Native American stock of today, including men with beards, as shown below. 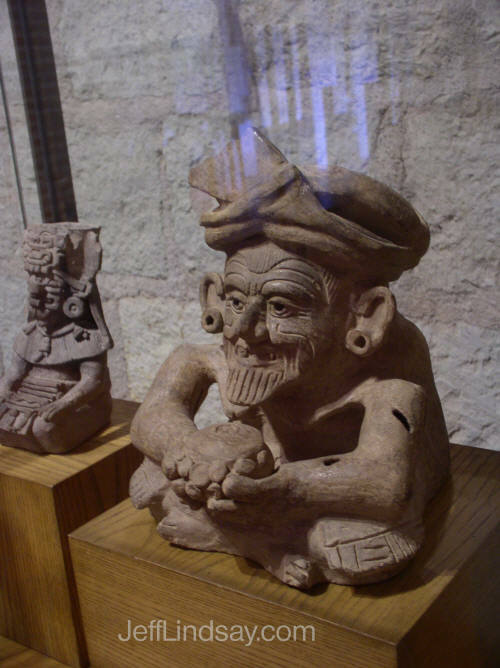 One of several bearded figures from the ancient site of Monte Alban, on display in the Cultural Center at the Santo Domingo Cathedral in Oaxaca, Mexico. We also saw the ruins at Monte Alban and also in Teotihuacan, where cement was used anciently, consistent with Book of Mormon descriptions about building with cement in the lands north of the narrow neck of land. Cement work at Teotihuacan near Mexico City. 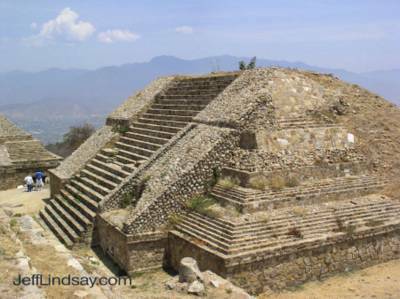 One of many ancient structures at Monte Alban, where cement was also used in construction. My sister and her family in Naperville, Illinois have a sweet little guinea pig named Spike. When he's happy, he make cute squeaking sounds, a little like a cat purring. They recently added a new pet to their household, a large female Doberman. With the friendly but voracious dog safely in its cage, the family introduced Spike to the Doberman. It was love at first sight for both! Perhaps Spike thought the dog was its mother, but it clearly loved its fellow mammal and tried to wiggle its way into the cage (the family held it back, naturally). Spike made its happy squeaking sounds near the dog, anxious to be near its true love. The Doberman also appeared to be strongly attracted -- in much the way it is attracted to a juicy steak. It salivates and gets that hungry look in its eyes when sweet Spike is near. Yes, come closer, please, closer. . . . The attraction is mutual, but quite different in nature and quite dangerous for the weaker party. If the kids aren't careful, one day Spike may find out just how much love can hurt. It's much like many human relationships I've seen. "But Mom, he's not that bad, really, and he loves me. We'll be happy together, I know it!" How grateful parents are when their children choose a mate wisely, and how painful it must be when they don't. The Lord's feelings on this matter must be greatly amplified, for his concern and love is far greater and more perfect than ours. In a small London house on Brook Street, a servant sighs with resignation as he arranges a tray full of food. he assumes will not be eaten. For more than a week, he has faithfully continued to wait on his employer, an eccentric composer, who spends hour after hour isolated in his own room. Morning, noon, and evening the servant delivers appealing meals to the composer and returns later to find the bowls and platters largely untouched. Once again, he steels himself to go through the same routine, muttering under his breath about how oddly temperamental musicians can be. As he swings open the door to the composer's room, the servant stops in his tracks. The startled composer, tears streaming down his face, turns to his servant and cries out, "I did think I did see all Heaven before me, and the great God Himself." George Frederic Handel had just finished writing a movement that would take its place in history as the Hallelujah Chorus. This excerpt comes from a book kindly given to me by a member of our Stake Presidency, Spiritual Lives of the Great Composers by Patrick Kavanaugh (Grand Rapids, Michigan: Zondervan, 1996 - the excerpt is from p. 27). I've been impressed with some of the spiritual aspects of many great composers. Quite a few lived rather disappointing lives, of course, but even they had their moments of religious contemplation and even fervor. The spirituality of Handel, Bach, and Mendelssohn especially impress me - how wonderful it will be to meet them after the Resurrection. Handel, for example, was a great but humble man who had struggled to overcome one failure after another. Eventually, in 1741, he was swimming in debt, in poor health, and facing debtors prison. But at that dark time, he was blessed to get a commission from a Dublin charity. Further, a wealthy friend gave him a libretto about the life of Christ, with the text taken entirely from the Bible. He began working on the music and became wholly absorbed in the project, producing 260 pages of manuscript in 24 days - achieving something that I think can be fairly compared to the output of Joseph Smith in translating the Book of Mormon. Some have called it the greatest feat in all of musical composition. He simply called the composition Messiah. Handel's work clearly had the signs of being driven and guided by inspiration from Heaven. He wrote to a friend about his experience composing it and quoted Paul: "Whether I was in the body or out of my body when I wrote it I know not." Handel finally came into some money after the huge success of the Messiah. But the proceeds were largely for charity. It premiered April 13, 1742, as a charitable benefit, raising 400 pounds and freeing 142 men from debtors prison. Handel conducted many of the performances during his life, raising large sums of money to support the Foundling Hospital and to help the poor in many ways. How fitting that a piece called Messiah should so powerfully continue the work of the Messiah Himself, while also bearing testimony of Him. Time for a Medical School at BYU? During lunch today with one of my best non-LDS friends, I was asked why BYU doesn't have a medical school. My friend said that when he was growing up in Taiwan, he became aware of Catholics through the outstanding hospital they ran, and thought it would be wonderful P.R. for the LDS Church to have more of a presence through hospitals and particularly through a medical school at BYU. He said that positive public awareness of Mormons grew greatly with the prominence of BYU as a university, and then through their football team, and now the next step would be to get a strong medical school. I'm not aware of the pros and cons of having a medical school, but the idea is intriguing. Might that happen someday? My family (wife and I plus our two younger boys) went to Mexico for spring break, arriving in Oaxaca, Mexico at about noon on Sunday, March 27 (two days later than planned due to serious overbooking by the airlines). The first thing we did after checking in to our little downtown hotel (Casa Cue) was to catch a taxi and head to a couple of local LDS churches in hopes of finding services to attend. Our second try was a success: the Antequra Ward, where we caught the tail end of sacrament meeting and then attended Sunday School. We were delighted at how warm the members were. Over a dozen people came to shake hands and greet us. During Sunday School, after I tried to answer a question in my poor Spanish, a beautiful 5-year-old girl came over to me and handed me the note shown below from her mother, and then the cute little girl gave me a kiss on the cheek with a delightful smile. My wife got a kiss from her, too. The sister who wrote the note to us later chatted with us for a while and just went out of her way to make us feel welcome. A note we received during Sunday School from a sweet Mexican LDS woman in the Anteqera Ward of Oaxaca, Mexico. 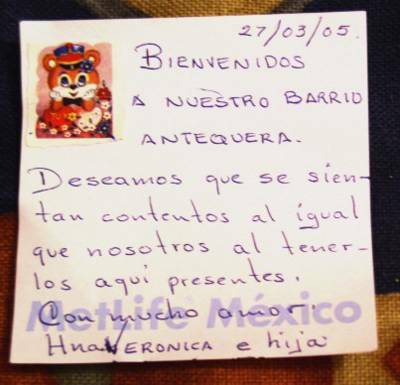 The note says something like, "Welcome to our Antequera Ward. We hope that you will feel just as happy as we do at having you present here. With much love, Sister Veronica and daughter." OK, I'm not suggesting that you need to send your children around to kiss strangers that walk in the door - I would frankly discourage that in most cases - but my point is that the courtesy and warmth the members of that small ward showed to us as total strangers left a strong impression. If I were going to be living in that area, it would be hard not to want to go back. How wonderful it is to be welcomed by people who genuinely seem to care. On the other hand, once I attended a ward in a wealthy part of California where I went out of my way to give people a chance to greet me, but was almost completely ignored. As a test, I stood by the doors at the end of sacrament meeting to see how many people would just walk by the stranger on their way out, and I don't think a single person stopped to greet me or inquire if I was moving in or anything. Maybe they often had too many visitors to deal with (but it was not a tourist area), or maybe I looked too familiar and not like a stranger, but I certainly left with little desire to ever be part of that ward. If I had been an investigator or less active member, that kind of treatment could have been devastating. The little things we do make a difference. I hope we will all go out of our way to look around and reach out a little more to those around us, especially to the strangers and newcomers and weak ones in our midst. A pound of preaching might do far less than an ounce of simple human kindness. I was in Mexico when the Pope died. The nation is in deep mourning for a dear friend of their country, a friend who visited them five times and gave special attention to their land and people. His respect for Mexico was obvious and great, and, as one newspaper said, truly "opened the heart" of Mexico's people to him. He was a Pope who reached out to all the world and cared for the peoples of this planet. If you have any doubts about the goodness of Pope John Paul II, one possible way to verify it is to observe that he was strongly disliked by the New York Times. That may just be prima facie evidence, in my opinion (blogger bias alert!). Look at the original article the Times Website ran on the Pope, as captured and discussed on PowerLine. The Times couldn't find anyone with something positive to say about the Pope, though they inadvertently let the world know that they had made a failed last-minute effort to find something positive. My heart goes out to Roman Catholics for the loss of their beloved and truly lovable leader. May the next Pope continue in the humble and steady footsteps of John Paul II. Andrea G. Radke has an interesting article at FAIRLDS.org, "The Place of Mormon Women: Perceptions, Prozac, Polygamy, Priesthood, Patriarchy, and Peace." Might be valuable for many of us. Belief-O-Matic: Just How LDS Are You? Belief-O-Matic is an interesting new quiz at Beliefnet.com that can show you what religious groups your beliefs most closely correspond to. Answer 20 multiple-choice questions and then see your scores. My results put me at 100% LDS, with lower scores for other faiths (e.g., 94% conservative Protestant, 80% Orthodox Jewish, and 24% Neo-Pagan - frankly, I only feel about 12% pagan, but what can you expect with automated testing?). Give it a try and find out just how LDS you are. A hat tip to D. Charles Pyle for calling my attention to this service.